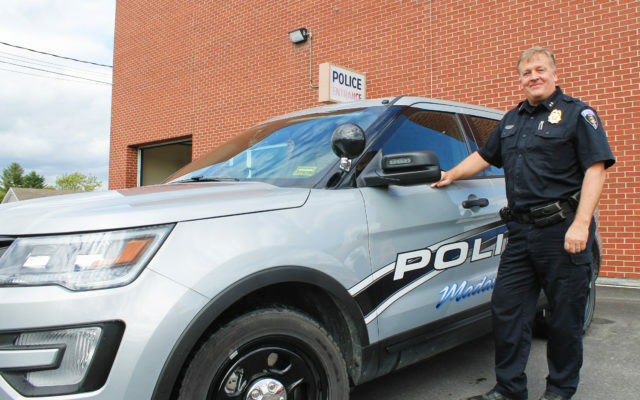 Warning about ‘cookie cartel’ operating in Madawaska spreads across U.S.
Madawaska Police Chief Ross Dubois didn’t realized he’d capture so much attention when he posted a notice on the department's social media page Tuesday warning residents of “highly addictive substances” feared to be making their way into town. 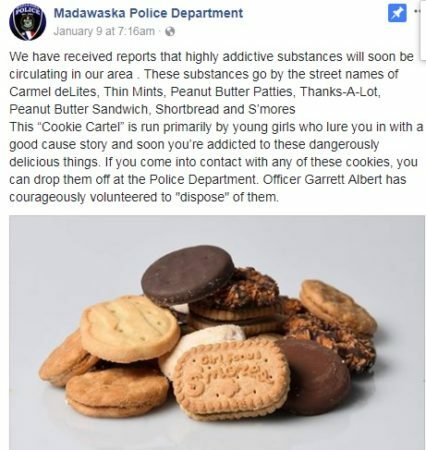 This screen shot shows the Madawaska Police Department’s Facebook post warning residents about a “Cookie Cartel” operating in town. MADAWASKA, Maine — Madawaska Police Chief Ross Dubois didn’t realized he’d capture so much attention when he posted a notice on the department’s social media page Tuesday warning residents of “highly addictive substances” feared to be making their way into town. “These substances go by the street names of Carmel deLites, Thin Mints, Peanut Butter Patties, Thanks-A-Lot, Peanut Butter Sandwich, Shortbread and S’mores,” Dubois wrote. He further warned of a “Cookie Cartel” run by young girls luring residents into buying the sweet treats. This likely is the first time a local Girl Scout troop was referred to in quite that way. But the post has gone viral online and been picked up by news stations as far as Kentucky and Oregon. The chief explained on Thursday that he was approached by a local Girl Scout leader to help get the word out about the cookie selling effort, which is an annual fundraiser for the organization. The chief’s creative and humorous solution may or may not pass the straight face test in front of an ethics panel, should a disgruntled taxpayer push the issue, but the post sure seems to have caught the attention of social media fans and news outlets. “Police hilariously warn against ‘highly addictive’ Girl Scout cookies,” was Thursday’s headline at mychamplainvalley.com. Dubois said he was very surprised the post has attracted as much attention as it has. As of Thursday afternoon, the post had been “liked” and shared more than 1,000 times and had garnered more than 100 comments. The Lexington, Kentucky, LEX18.com news site was one of several that picked up the post. “A police department in Maine is warning people against addictive substances that are being peddled … by young girls in uniforms,” the site states. Unlike H. G. Wells’ 1938 “War of the Worlds” radio broadcast, Dubois’ post has not created widespread panic in the streets, except perhaps for some tasty cookies. Always willing to put public safety first, Dubois’s post included this offer. As of Thursday afternoon, no deliveries of illicit cookies had been made to the police station.